Rapid changes in the solar power sector are fueling a green energy revolution. With so much emphasis on solving the global warming puzzle, technology in solar is advancing very quickly and may be the answer we’ve been looking for. Let’s take a look at how this industry is changing so quickly. The biggest detractor for solar in the past has been simple: it was just too expensive to be practical. Coal generated power was as much as 90% cheaper than solar power. But with the massive investment in production capacity, coupled with the global economic slowdown, prices on solar panels have come down anywhere from 10%-30% in the last 6 months. This means that many projects that were borderline before are now feasible. And the trend appears to be gaining steam. Prices on Sharp solar panels, for instance, have been lowered 3 times since May, bringing their cost into the $4/watt range. Just last year they were closer to $5/watt. Companies such as FirstSolar, Nanosolar, and Sharp are quickly bringing solar film, also called thin-film solar, to market. We’ve been promised this amazing technology for years and it seems its finally here. Thin film is manufactured in a way that is similar to printing, and the product often comes in a roll. This is a much more efficient way of producing cells than the traditional solar panel, which was made in a process similar to microchips. We are seeing initial pricing on this new technology in the $1 to $2/watt range. 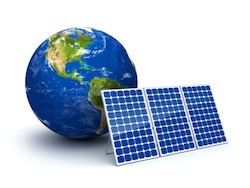 Solar efficiency is the measure of power produced versus the sun’s energy that hits the panel. In the past any efficiency over 15% was seen as good, and approaching 20% was great. Now such panels as SunPower’s are regularly achieving 22%. That means more bang for buck and more energy produced for every square inch of panel installed. Solar film is leveling the field on efficiency. Thin film traditionally had efficiencies in the 10% area, roughly half the efficiency of crystalline panels. While that measured quantity has trended up slightly, industry professionals are finding that actual production is higher. This is because the film produces better in diffuse light and partially shaded conditions than panels. In one project in Israel, installers recently found that the thin film solar only required 25% more surface area compared to crystalline panels to produce the same energy. This means that actual efficiency is probably closer to 15% for film. Utility scale solar is PV power for the masses, brought to you through your traditional power lines. Usually the power plants are located in desert areas with ample sunshine. They often use a technology called concentrated photovoltaics (CPV) that uses mirrors, tracking devices, and advanced solar panel technology to squeeze (almost) every drop of energy from sunlight. Due to new federal rules on depreciation, generous tax credits, and technological advances, utilities and investors can install these systems profitably. In the next 5-10 years we will probably see the record for largest CPV installation broken several times over. Projects in Colorado, California, and Arizona are already under way and will vie for the nation’s largest when complete. While this isn’t necessarily good news, it’s certainly overdue. Until we wrap the true environmental cost of producing carbon into the cost of electricity, our environmental picture will not improve. Whether we do that through cap and trade, a carbon tax, or another way, it means that power is going to cost more in the short term. This increased cost will encourage energy efficiency and drive improvement in the production, transportation, and storage of electricity. It will also make solar power look more attractive. Speaking of innovation, research and development will change the industry in ways we’re not even aware of yet. Our wonderful university research programs are driving tremendous changes in the industry. Energy has become a focus of federal and industry dollars, much the way telecommunications and information technology was in the last decade. College programs now emphasize energy efficiency in all aspects of design and engineering, and integrating solar in buildings, vehicles, and even clothing have become the norm. It seems like every week we hear about a breakthrough in solar panels, thin film solar, and battery technology in our university research programs. One sure sign of change to come is when Silicon Valley venture capital gets involved. These funds are only interested in investing in sectors that are rapidly growing and can make gobs of money in a short time. So when you hear they are investing billions of dollars in photovoltaic technology, and a new deal seems to be coming every week, you can bet there are big things on the horizon. These prognosticators may not be right all the time, but you can bet they don’t throw their money away at weak prospects. The same guys who made huge bets on Google, Yahoo, and Netscape are now putting their chips on the energy sector, and specifically solar power. Kriss Bergethon is a writer and solar expert. He and his wife live off the grid in Colorado.